Seattle’s first-ever “Handathon” brought together students, faculty, and clinicians last weekend for a 24-hour, hackathon-style challenge to build better 3-D printed prosthetic hands. 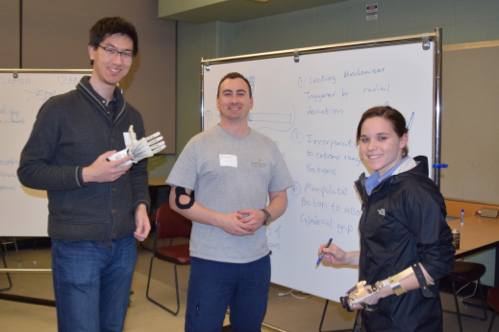 The event included two dozen participants from the engineering and prosthetics & orthotics (P&O) programs at UW-Seattle, UW-Bothell, and Seattle Pacific University. Teams were challenged to improve the latest open-source 3D-printed hand design, the Raptor Hand – from functional improvements to crazy design ideas. All teams had access to a CAD lab, 3D-printers, tools, actuators, electronics (Arduino, electromyography, etc. ), and enough pizza, coffee, and treats to keep them energized for 24 hours. At the end of 24 hours we were amazed at the designs and improvements the students had developed. The winning team, Dexterity, had two P&O students on the team and focused on function and comfort. They modified the thumb to provide more degrees of freedom and allow multiple types of grasps. To improve comfort, they incorporated a neoprene sleeve. The second place team, Myo, used an Arduino with electromyography to create a locking mechanism for the hand. The current hand design lets users open and close the hand by flexing and extending their wrist. However, if you want to hold onto something for a long period, you have to keep flexing your wrist. To reduce fatigue, Myo created a simple mechanism that could lock the hand into a specific position triggered by electromyography. Congratulations to all the participants! Over the next few weeks designs will be uploaded to the E-nable community to let others continue to build and innovate on the open-source designs. From Seattle, we challenge more groups to take hackathons from programming to physical devices! The Handathon was organized by Dr. Kat Steele, a UW assistant professor in mechanical engineering and students in her Ability & Innovation Lab, along with Mark Ganter, a UW professor of mechanical engineering; Sue Spaulding, a UW teaching associate in rehabilitation medicine; Pierre Mourad and Ivan Owen at UW Bothell; and Adam Arabian at Seattle Pacific University. 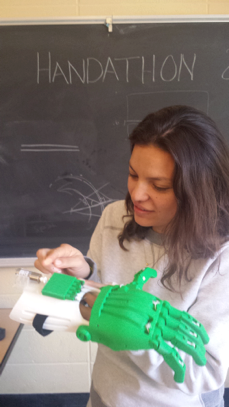 Karla Vega incorporates the actuator for Myo’s locking mechanism.